Details: 2 Bedroom. 2 Bath Unit, sleeps 7. Be spoiled in this gorgeous two bedroom-two bath Orange Beach vacation rental at the Caribe Resort! This lovely condos has been professionally decorated, and includes a boat slip. There is king bed and twin size sleeper in the master, a king bed the guest bedroom and a full size sleeper sofa in the living room. Desirable rental home rental home upgraded stainless steel kitchen appliances, a full size washer and dryer and a kitchen that is well stocked to meet your every need! The extra large private balcony overlooks the bay, the gulf, two swimming pools and the lazy river! In the morning, enjoy a cup of coffee on the deck and watch the dolphins swim past, admire the beautiful boats that cruise in the bay or gaze over the amazing Gulf of Mexico. The balcony is accessed from both the living room and the master bedroom. There are 9-foot ceilings throughout with gorgeous floor-to-ceiling windows for you to enjoy. 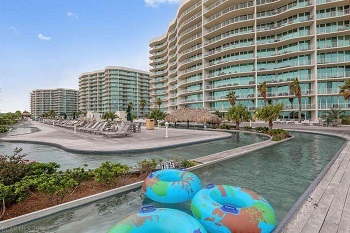 The post Caribe Resort Vacation Rental, Orange Beach AL Condo appeared first on USBeaches.net. The post Caribe Resort Vacation Rental, Orange Beach AL Condo appeared first on Beach Traveler.